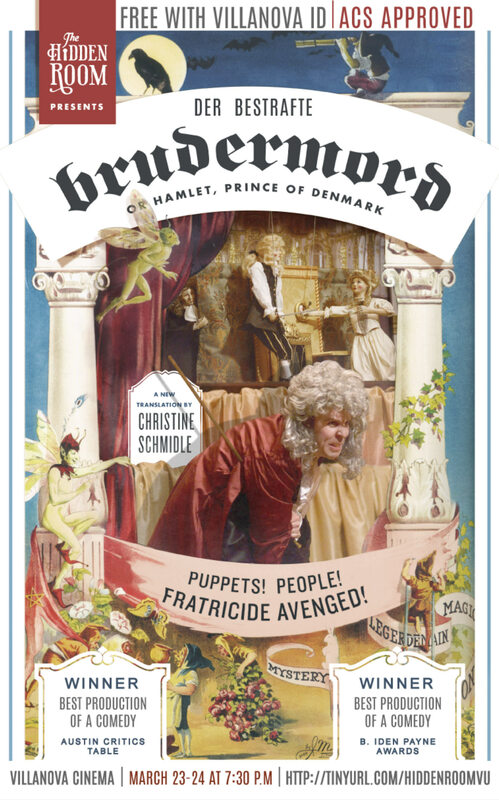 On March 23-24, Villanova will host award-winning Texas-based theatre group The Hidden Room to stage their original-practices puppet-show production of der Bestrafte Brudermord, the mysterious slapstick Hamlet found in a German manuscript in the 18th century. The Hidden Room’s visit to Villanova will include a talk by Zachary Lesser, PhD, of the University of Pennsylvania; two evening shows, each followed by an artist talk-back; and two workshops on theatre scholarship, dramatic practice, and arts entrepreneurship. Events will take place in the Villanova Cinema and are free with a Villanova or Penn ID. Seating will be first-come. ACS Approved. Direct questions to Alice Dailey, PhD (alice.dailey@villanova.edu). The Hidden Room’s collaborations with scholars from Shakespeare’s Globe, the American Shakespeare Center, and, most recently, Oxford University’s Tiffany Stern have yielded theatrical events that have won multiple awards, critical acclaim, and international attention. Using Hidden Room’s der Bestrafte Brudermord as a model, this discussion hopes to illuminate ways that theatre practitioners might build successful working relationships with scholars and use their research to infuse old plays with new life. The Hidden Room’s artistic director/theatrical deviser, Beth Burns, has worked as an actor, writer, director, stage manager, teacher, lighting board operator, publicist, grant consultant, tour manager, box officer, usher, house manager, dresser, personal assistant, talent wrangler and janitor. Burns invites you to learn from her mistakes as she details her successes, stumbling blocks and ways into the future with a focus on a creating a sustainable economic model for a theatrical company.